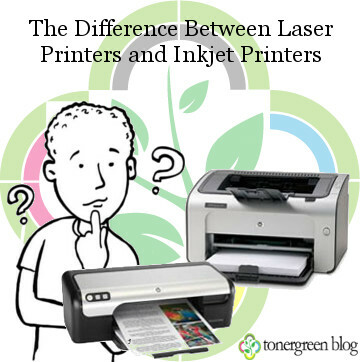 The Difference Between Laser Printers and Inkjet Printers | TonerGreen - Eco-Friendly Toners from the U.S. Printers have been a useful machine at home and at the office over the years, producing text and graphic documents stored in electric form or digital form in computer devices and gadgets. There are mainly two types of printers: (1) laser printers and (2) inkjet printers. Laser printers rapidly produce high-quality text and graphics via its printer consumables, laser toner cartridges. This type of printer employ a xerographic printing process but differ from analog photocopiers in that the image is produced thru the laser drawing the actual image it processed from the computer on the photo-receptor drum. The photo-receptor drum then transfer the toner powder onto the paper thru heat thus producing the printout itself. Inkjet printers, on the other hand, are printers that use inks instead of toner thus the term "inkjet printers". The inkjet printers work thru the printer's head where the microscopic nozzles are. During the printing process heat is being transferred to this nozzle melting the ink and releasing droplets of it onto the paper thus making the ink printing possible. Aside from the difference between their printing processes, the two printers differ as well in terms of their printing speed and price. Laser printers often cost higher than the inkjet printers and so does its printer consumables but when it comes to print speed and producing printouts with sharp text characters, they are way better than inkjet printers. These laser printers are also considered as workhorse printing machines, able to deliver high-volume of documents at astounding print speed. These qualities are what makes them in demand in business environments. However, if you're printing demands centers in printing photographs and images then definitely inkjet printer is the right type of printer for you. Since these printing machines use liquid ink, they are likely capable of producing outputs with lively and vibrant colors that matches those photos produced from dark rooms. At TonerGreen.com, one of the leading eco-friendly printer supplies retailer, offers a wide range of remanufactured toner cartridges and inkjet cartridges that are price and quality-wise. These remanufactured printer cartridges are all made in the U.S. and went under several quality-control tests to make sure they meet or exceed the performance and print quality of those OEM cartridges.